What does one do when things go wrong? Also known as “Adaptability, part 2″ and “Where does innovation begin, part 2″. Life gets messy sometimes. We can’t help it; interacting with other people can get complicated and mistakes happen. We make mistakes. Other people make mistakes. We can feel overwhelmed. Strong feelings can be an extraordinary catalyst for creativity. It’s well-known that exultant joy makes one want to sing with all one’s power, that some of the most beautiful art is made by hearts that have been broken wide open until the most tender interiors are exposed, and that every great piece of literature ever written contains some kind of conflict. Harrowed ground is a fertile and suitable place for growth, both in the physical and spiritual realms, because growth cannot happen in a hard, unforgiving place. Seeds planted on stones don’t stand much of a chance. No, a good, sharp hoe is often required to remove the stones, to soften and mix things up before new growth can happen. It takes a forgiving, stretchable environment. My greatest joys, my children, have come at a price. Creating them was not easy; pain was involved. One delivery almost cost us two lives. Almost. My work with my children continues to involve both splendor and difficulty, times of bliss and moments of distress, but it’s all essentially good. It all has been good since the very start because of the joy I’ve experienced through creativity and because of the knowledge I’ve gained through the struggles. Learning and creativity are inseparable. When one learns something, it is created anew in the learner’s mind; a discovery takes place. When one creates, the creator learns something new; discovery happens again. When anguish or exuberance spurs on the creative process, it adds a certain energy to the project, an urgency, because the emotion is processed through the act of creativity. Art is therapy for the artist. Creation is therapy for the creator; it provides both relief and a sense of joy at having made something beautiful out of those strong feelings. One overcomes through art/beauty/creation and arrives at a new and (hopefully) more enlightened place. As I stated in a previous post, we are creatures with a powerful ability to adapt to outside change. When changes are incredibly painful, it’s a great relief to have a well-grounded faith in Jesus Christ. He is the one who is able to take injustices and make them okay- not usually in reality at the very moment, but eventually and because of our faith. We lived in Ankara, Turkey, in 2001-2002 while my husband was doing research through the Fulbright scholarship program. While we were there, we got to know a great family from Utah: she was American and he was Peruvian. Lorrie shared this great quote with me which was given to her by her mother-in-law and which had carried her through some pretty rough times. I don’t know its original source, but it goes like this: “Everything will be okay in the end. If it’s not okay, it’s not the end yet.” To me, it’s a perfect description of faith and I hold tight to this idea. When our lives suddenly encounter really big troubles- and every life will, it’s part of the plan- we might feel like God isn’t taking care of things like He should. Where’s the Savior when I really need Him? Haven’t I been good and don’t I deserve to be saved from ________? Can’t He reverse all this mess and give me back my former idyllic, relatively trouble-free life? Can’t He save me from the world? He can and He will, eventually, but that’s not why He came the first time. The atonement of Christ is to save me from myself, not from life. To make it apply, I have to have faith, repent of my own errors, forgive what is weak in others, and follow His example in any way I can. It’s like tilling the soil in my heart. When my soil is not hard and stony but soft and ready, then He comes in with a healing, enlightening power that makes marvelous things grow. He came to save those around me, also: anyone who has wronged anyone else along the path of life, and that includes us as both the victim and the perpetrator. We all make mistakes and life gets messy. He is the great cleanser. Justice and mercy will come together in a beautiful way… later. In this life, we’re not meant to be saved from hardship, persecution, injustice, or even death! It’s how we react to those things, how we endure them that counts. I believe we learn from and endure those experiences better when we are anchored by faith and can feel the love of Jesus Christ. My four year old thinks he knows what’s best for himself. His idea of a good life includes a lot of ranch dressing and Nutella, very little bathing and no enforced bedtime. I have ideas about what’s good for me, too, but it’s not always congruent with the way life goes. I have enough faith in God to know that He can take any difficult situation I might face and make something good come from it. My mind goes back to the story of Adam and Eve, who knowingly chose the hard road out of Paradise because of the joy and learning they would experience through a life of hardship and creating. She recognized the value of that change for their family without knowing exactly what their new life would be like. They went on faith, though I have to imagine that it wasn’t an easy transition. One woman’s paradise is not necessarily another woman’s. I have a good friend who moved here from a paradisical place (in her view) where she had many friends like herself and where she was very comfortable. It was a hard move- still is sometimes- but she and her husband knew the value it would bring to their particular family and they have been richly rewarded for their faith. But, like a tree that had been in the forest for a long time and was suddenly replanted on a windy, isolated hillside, some adjustments had to be made. Personally, the windy hillside suits me just fine. I love reading Isaiah. A particular verse in chapter 51 caught my attention recently (verse 16, where he talks about planting the heavens) and I spent the rest of my readings to the end of Isaiah discovering personal insights regarding seeds, plants, and God’s plan for us. In the midst of all of that is chapter 61. It’s a beautiful chapter in which Christ’s atonement is described and covenants are promised. Through Christ’s atonement, something new is created. Through His pain, I am made into something different, something clean, something more powerful and beautiful than I ever could have hoped to have become on my own. He recreates me and I am reborn. Not only that, I can become a “tree of righteousness” and be part of His plantings. I can grow in fertile soil “…that He might be glorified.” What is is His glory all about? Us. We are His glory. He can give me beauty for ashes. When difficulties arise, He helps me through it both by offering peace and mercy and also by being a marvelous example of creativity. 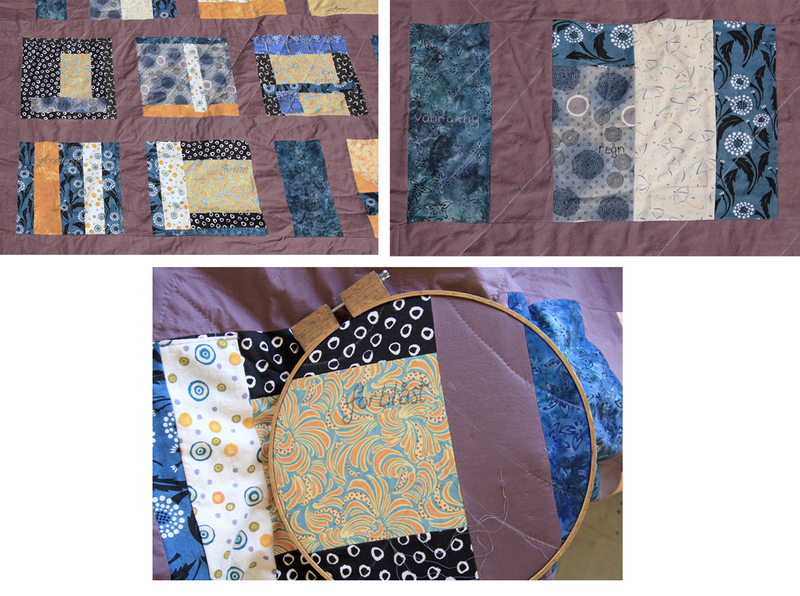 I have begun a creative, layered project which will take some time to finish. 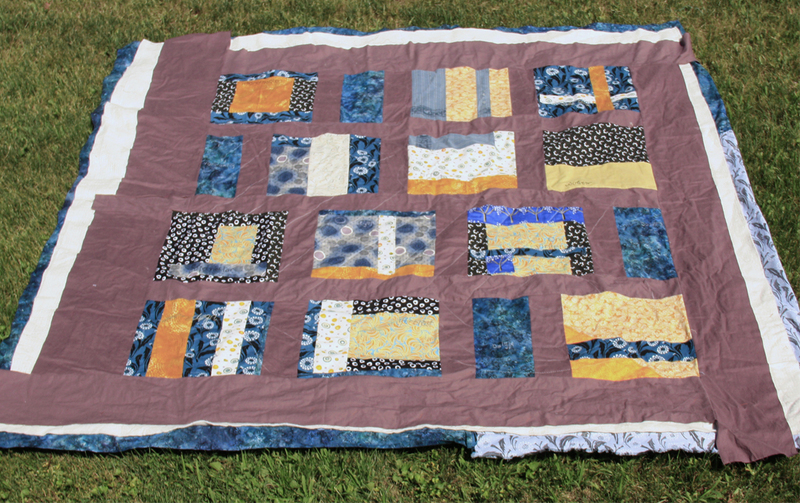 It’s a quilt in which clashing and chaotic patterns mix with soft colors. Norwegian words of nature and seasonal change are embroidered throughout. I’ll post a picture again when it’s all finished, but here is the general idea. When life gets particularly hard, here’s advice I give myself: it’s okay to cry, just make sure you forgive. And let go of the burden through both faith and creativity. Forgiveness is one way we put faith into action. It’s how we make the atonement real in our lives. It keeps us connected to God and it’s part of how He saves us. Creativity is how we get to make something beautiful out of ashes. Everything will be okay in the end. If it’s not okay, it’s not the end yet. This entry was posted in Life, Philosophical, Religion and tagged Change, creativity, life, religion, seeds by Maren. Bookmark the permalink. What a marvelous and wonderful person you are. Beautiful and wise. You, the post, and the quilt. Beautifully said Maren! I love your insights and your creativity. We love you and your creativity. love this. need to bookmark it so it will be handy for a re-read. miss you friend.